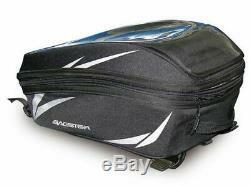 Bagster Motorbike Motorcycle Impact Tank Bag Luggage - 21 Litres. Description The IMPACT tank bag is the simplified version of the Rider accessible for all budgets flexible volume practical in all circumstances and a map holder easily accessible. The gusset improves the contents (the most important of its category). A tidy pocket within easy reach for the personnel effects. W 39cm, L 44.5cm, H 22-32cm - 21L. Since then, MSG Bike Gear has grown to one of the biggest helmet and motorcycle accessory dealers in UK. MSG Bike Gear is a small family-owned company based in the North East of England between Darlington and Stockton-On-Tees. We work out of a countryside unit overlooking the River Tees. Due to our success over the years and the growing demand for our products locally, we opened our own showroom on the farm in 2015 which is in the perfect setting for bikers to ride out to and try on the latest gear. Look out for the green MSG signs on the country lane behind Durham/Tees Valley Airport. We have a passion for delivering high quality customer service, with a dedicated team on board to deal with any queries at any time. Over the telephone and face-to-face we have a dedicated, well-trained team of experts who will advise on our whole range of products. If you know exactly what you want, we shall do our utmost to get it for you; if you'kind of' know what you want; we will find the best product for your needs and budget. MSG Bike Gear sells everything you need to ride your motorcycle including helmets, boots, clothing, gloves. We are official stockists of all the latest designs in the top of the range brands. We also find quality bargains in previous years? Ranges and pass the savings onto you, the customer. Bikers with every bike, with every passion, with every budget will find what they want to need at MSG Bike Gear. You can trust MSG because. How is my item sent? Any small, low cost items and weighing less than 1000g will be sent to you via 3 day courier unless a quicker service is cheaper to use. Larger/heavier and more valuable items will be delivered by our courier. If you notice any damage on the package or if you think it has been mishandled always sign as damaged. How long will it take to receive my order? Dispatch times are shown in the listing. However any goods ordered after 3pm on Fridays or over the weekend will not be dispatched until Monday. ALSO NOTE THAT INTERNATIONAL DELIVERYS ARE ONLY AVAILABLE TO MAINLAND DESTINATIONS. If for any reason you would like your items to be delivered later than the advertised timescales we will make every effort to help. How can I track my order? If you have provided us with a mobile telephone number you will also receive an SMS text informing you on when your items are likely to be delivered. At present order tracking is only available for items that have been sent to you via our courier service. What happens if I'm out when you deliver? If you are unable to be home when we deliver the courier will leave a card stating that they have attempted to deliver your consignment while you were out. For example, in this case it is at the driver? S discretion whether he leaves the item and you will assume full responsibility for the package. What if there is a problem with my product? We do advise that you check your goods thoroughly on receipt as you are signing to say that you received them in good condition. This does not apply to faulty items. Heavy items are advised to be sent by Courier. This listing is currently undergoing maintenance, we apologise for any inconvenience caused. The item "Bagster Motorbike Motorcycle Impact Tank Bag Luggage 21 Litres" is in sale since Wednesday, April 3, 2019. This item is in the category "Vehicle Parts & Accessories\Motorcycle Accessories\Luggage\Tank Bags". The seller is "msgbikegear_direct" and is located in Eaglescliffe.